WRIGHTWOOD, Calif. – Locals worry and take measure to prevent harmful effects of increased activity from visitors spending time in the snow. Because there is so much condensed activity in Southern California mountain communities during the snow season, there is an increase of waste buildup. Due to increased environmental stress, local mountain communities have the possibility to begin to disappear. Because of visitors, places like Wrightwood are having dams dug in place of the trees that don’t have the opportunity to grow. Keel says he actively plants trees within San Bernardino County, but snow visitors trample over the growing trees, killing them. Mindless activity, like stomping on newly planted trees, could eventually hurt the environments outside of the mountain communities, Keel explained. In addition to an eventual disappearance of mountains in Southern California due to erosion, wildlife could diminish, demolishing the ecosystem. Because of the immense amount of traffic in the small mountain communities, multiple rounds of salt and cinder are being laid to make sure that the roads are clear and safe for drivers. With all the traffic and extra salt, vegetation is at risk. Janna Beckerman from the Department of Plant Biology at Purdue University said that trees closer to roads where salt is laid are at higher risk for death. With recent discoveries by the Wrightwood locals, residents are concerned about the future of Southern California forests. 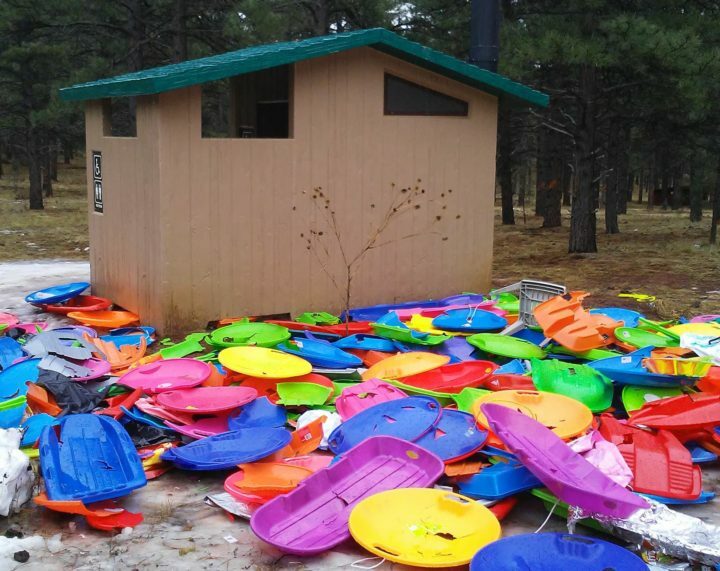 Leading up to the first couple of snow storms of 2018-2019, Vickie Elefante, a new Wrightwood resident, began to see that not only were the snow visitors piling in, but they were leaving behind garbage and personal belongings. To encourage visitors to have fun and clean up after themselves, Elefante made a large sign to remind visitors to clean up after themselves. Elefante pointed out that this mass of expended items in the forest is not biodegradable and will hurt the animals and plants trying to grow and thrive. Working hand in hand with community members like Elefante, Mountain Hardware in Wrightwood has seen the damage that can happen after a good snow storm with fresh powder and flocks of eager snow players. Mountain Hardware has clean-up team that clean the forest weekly; and they get about half a truck load of sleds alone each time. Mountain Hardware cleans up these sites because they know that trees and animals could be harmed by all of the plastic left behind. According to the Environmental Protection Agency (EPA), plastic is the worst kind of waste for the environment and its inhabitants. The reason for this is that animals eat the plastic, it fills their stomachs and they die because they have starved by not eating any food. Not to mention, these plastics wash into rivers, streams and oceans creating a universal issue of negative ecological change.